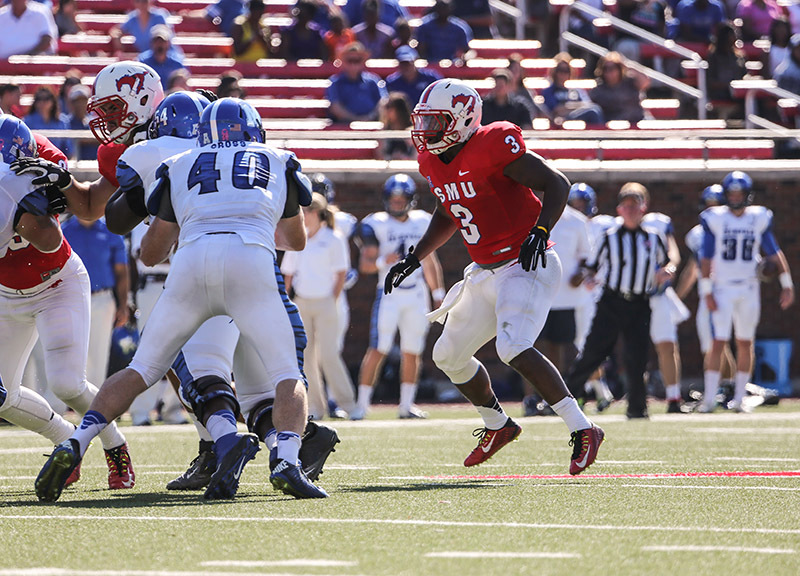 After Seven Straight Losses, Linebacker Kevin Pope Is One Of SMU's Lone Bright Spots. 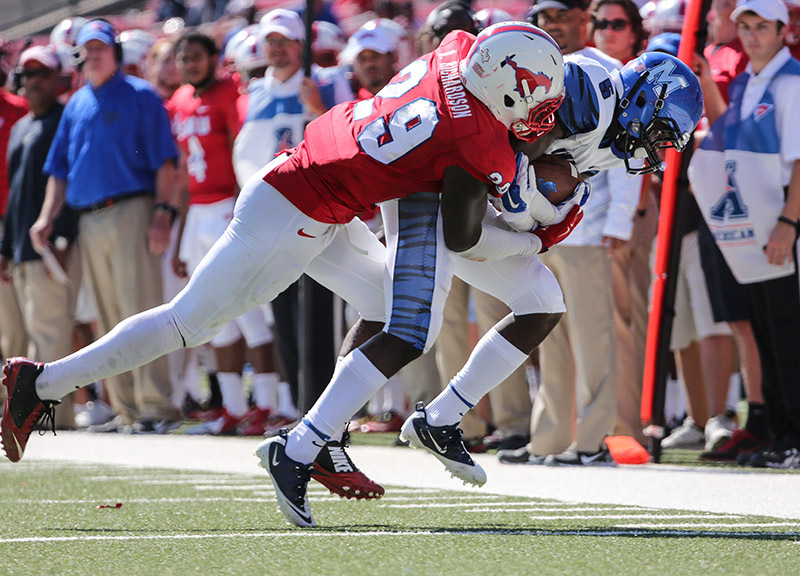 The SMU Mustangs lost their seventh game of the season on Saturday to the Memphis Tigers, a conference foe, 10-48. 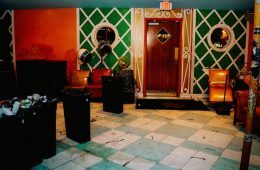 Worse, the loss officially eliminated the team from being bowl-eligible, and insured the Mustangs of finishing with a losing record. 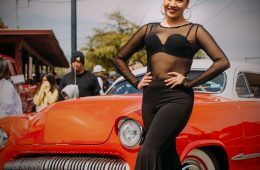 There's no denying this has been a terrible season for the Mustangs all around, and the near-empty Ford Stadium in the second half on Saturday proved that this team has lost what little remained of its support. 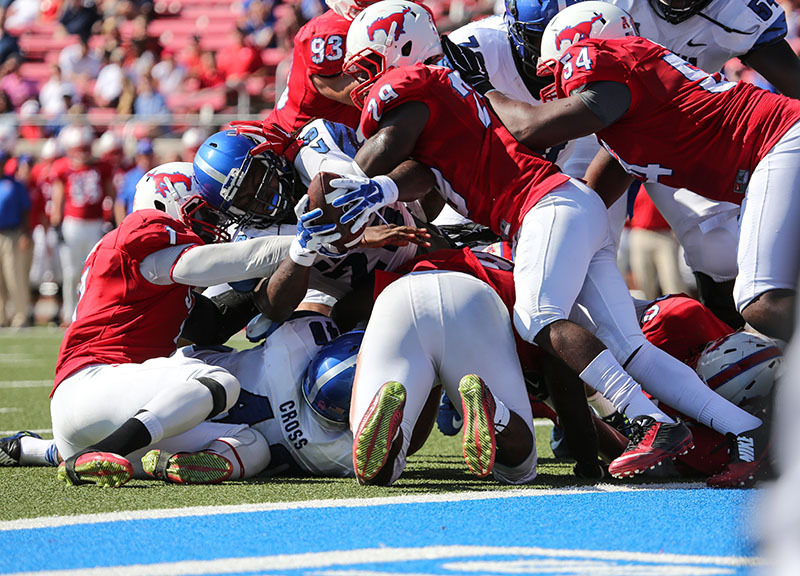 The product on the field isn't pretty, and, statistically, SMU is the worst team in the FBS. SMU is the only winless team in the country, ranks last in scoring offense and scoring defense, last in total defense and second to last in total offense. 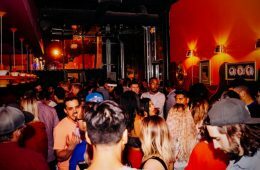 A season like this was definitely not what senior Kevin Pope envisioned for his team heading into the season. After missing the 2010 and 2011 seasons due to injury and earning a medical waiver, Pope is in his fifth and final year with the Mustangs — and he undoubtedly didn't want to end his collegiate career this way. Last season, Pope led the team with 91 tackles from the linebacker position. 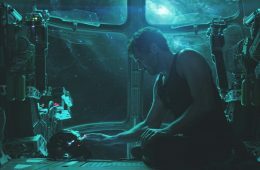 After several injuries at running back, Pope then started getting carries at that position as well, while still keeping up his defensive duties on the other side of the ball. 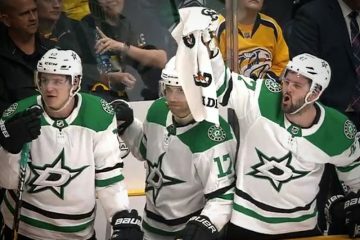 Coming into this season, he earned the No. 1 running back position, but with the paralyzing struggles the offense has had thus far — including a four-way round-robin quarterback shuffle — interim head coach Tom Mason thought Pope would be more valuable to his team if he returned to his linebacker role for the rest of the season. Last week against Cincinnati, in his first action at linebacker this season, Pope stepped in and recorded seven tackles. This weekend against Memphis, he led the team with 12 tackles and also recorded a sack. In the second half of this week's game, after things were already way out of hand, starting running back Prescott Line was on the sideline having an ankle injury attended to. And after backup running back Luke Seeker sustained a huge hit, it appeared as if Pope was lobbying for some carries. 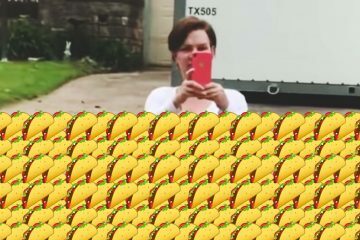 Still, Mason stuck to his plan of keeping Pope on defense only. For a senior who was fortunate enough to play college football for one more year, his effort has shown gratitude this season. He's certainly leaving it all on the field. 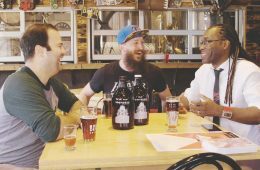 To his credit, the losing season hasn't affected Pope or his play on the field. For now, the team's lone bright spot is only concerned with going out every play and giving it his all. 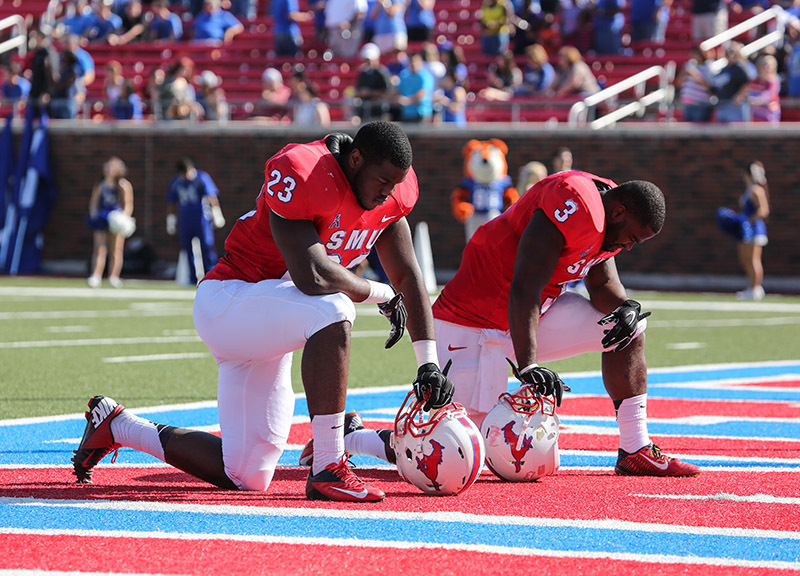 Team captains and linebackers Stephon Sanders (23) and Kevin Pope (3) pray in the end zone before the Mustangs' conference game against the Memphis Tigers. 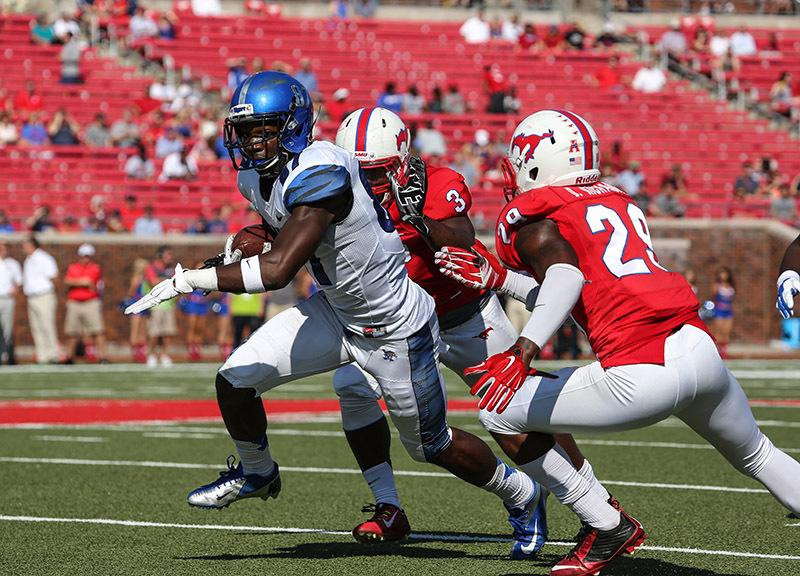 Memphis wide receiver Tevin Jones (87) breaks away from the Mustangs defense after a reception. Jones finished the game with five receptions for 70 yards. SMU linebacker Kevin Pope (3) reads the offense after snap in the first half against Memphis. Pope led the Mustangs with 12 tackles and also had one sack. Memphis running back Jarvis Cooper (25) runs through an attempted arm tackle by a Mustangs defender. Cooper ran for 93 yards on 16 carries and scored two touchdowns. 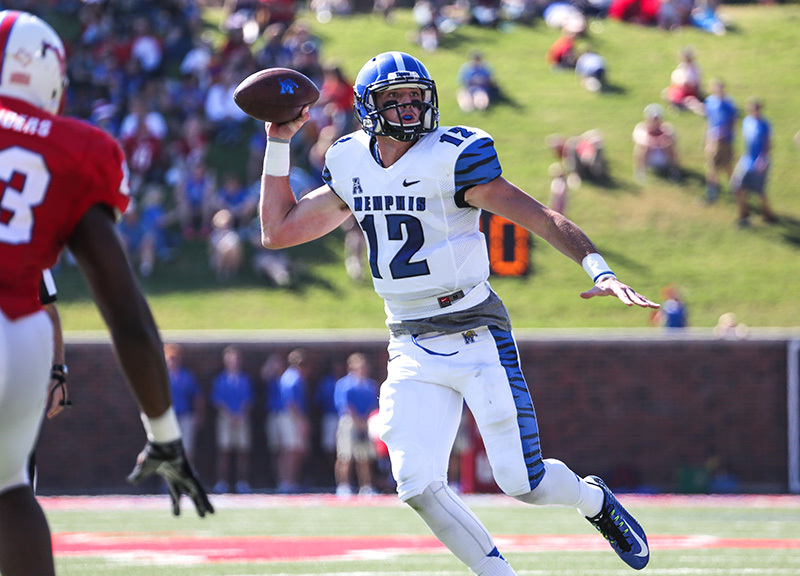 Memphis' 6-foot-7 quarterback Paxton Lynch (12) scrambles out the pocket and fakes a throw. Lynch threw 17 passes for 307 yards and one touchdown against the Mustangs. 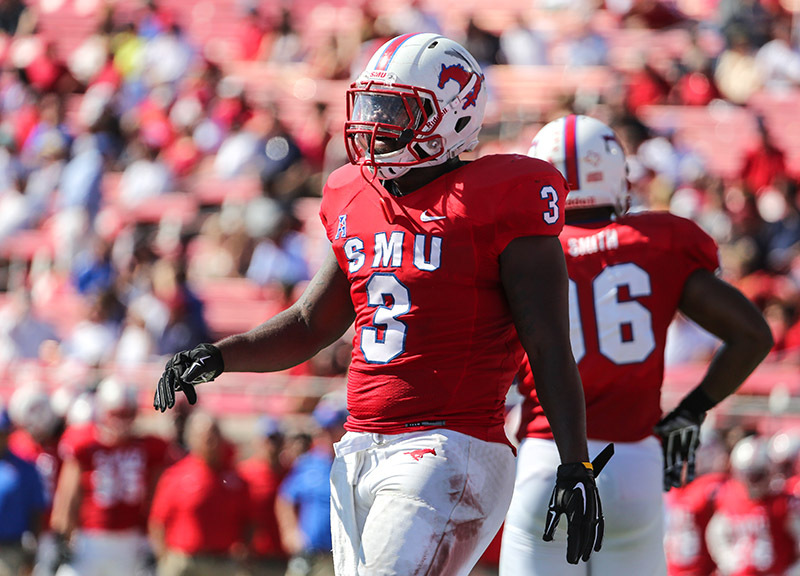 SMU linebacker Kevin Pope (3) catches his breath as the Mustangs prepare for goal line defense against Memphis. 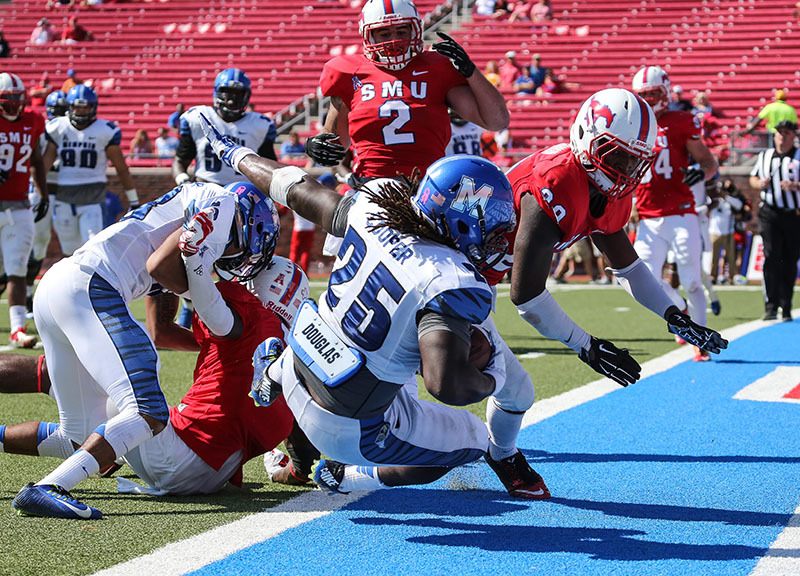 The SMU defense stops Memphis running back Jarvis Cooper (25) on the goal line. 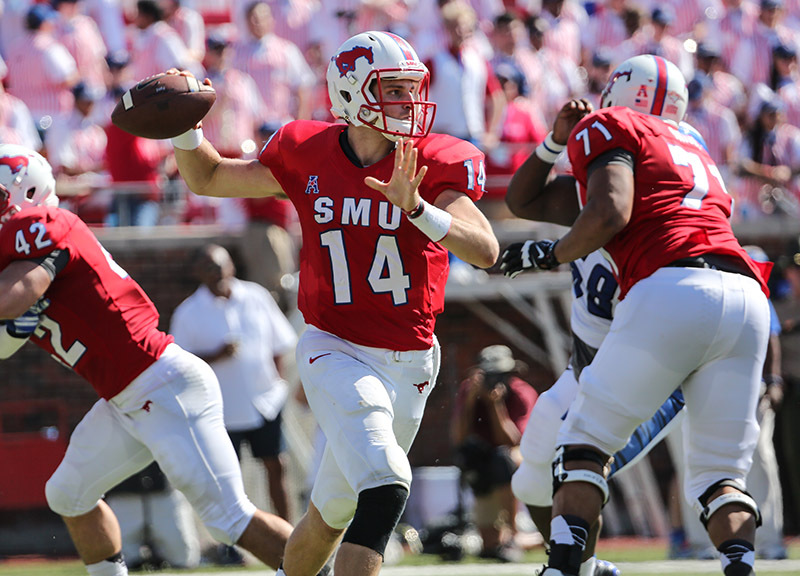 SMU quarterback Garrett Krstich (14) attempts a pass in the first half against Memphis. Krstich complete 10 passes for 59 yards and two interceptions and was replaced by Matt Davis in the second half. 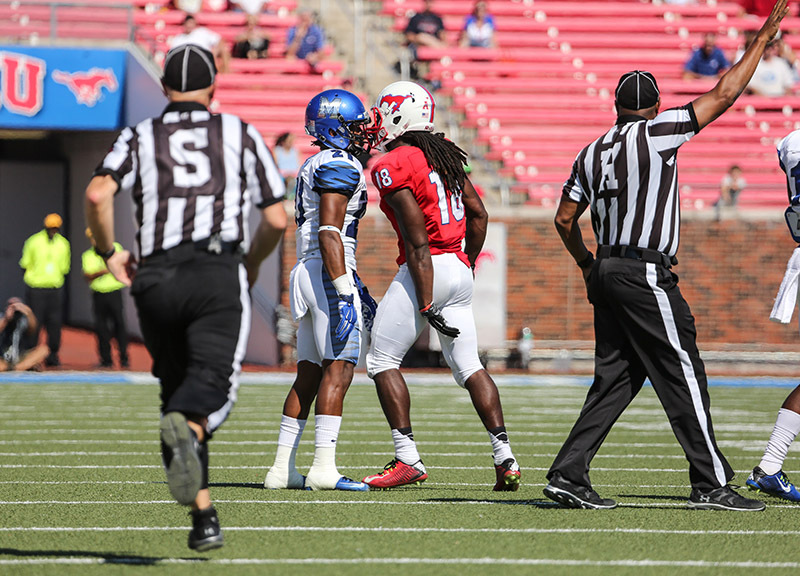 SMU wide receiver Darius Joseph (18) jaws with Memphis defensive back Bobby McCain (21). SMU running back Prescott Line (42) tip toes along the sideline. Line finished with 12 rushes for 38 yards and one touchdown. 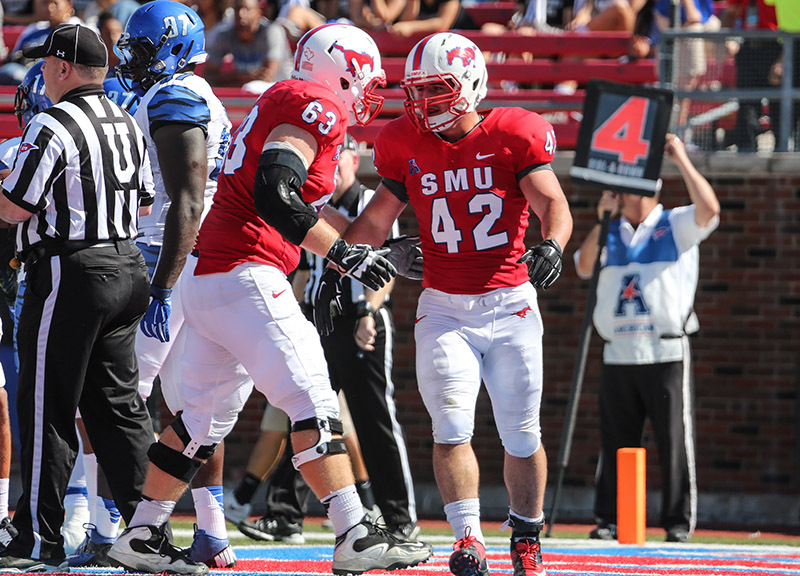 SMU offensive lineman Evan Brown (63) celebrates with running back Prescott Line (42) after a touchdown. 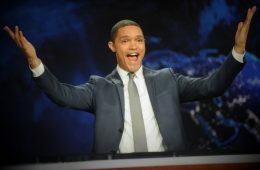 Line's score was the first touchdown of the season at home. 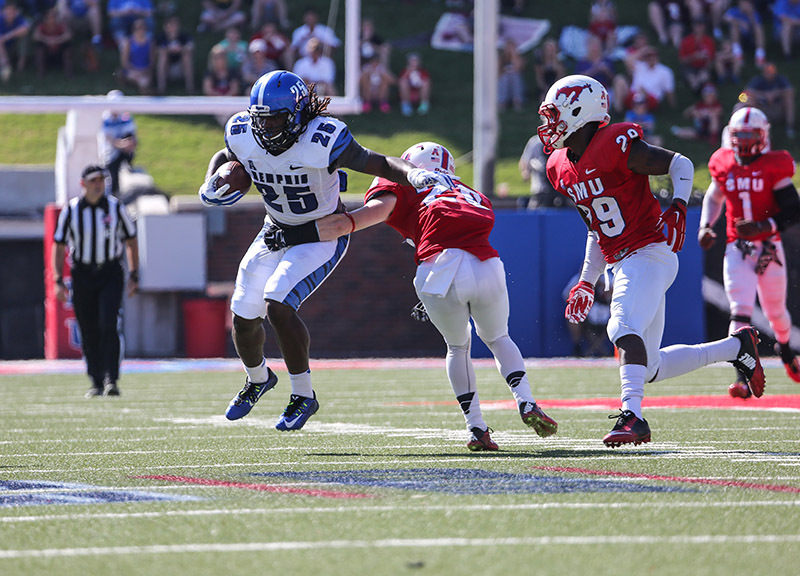 SMU defensive back Darrion Richardson (29) drives Memphis wide receiver Mose Frazier (5) out of bounds. 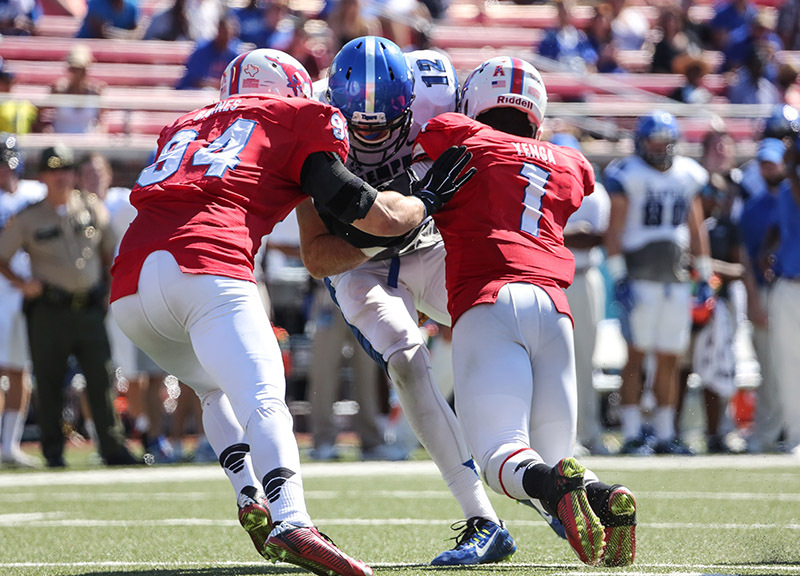 SMU defensive end Beau Barnes (94) and linebacker Jonathan Yenga (1) bring down Memphis quarterback Paxton Lynch (12). 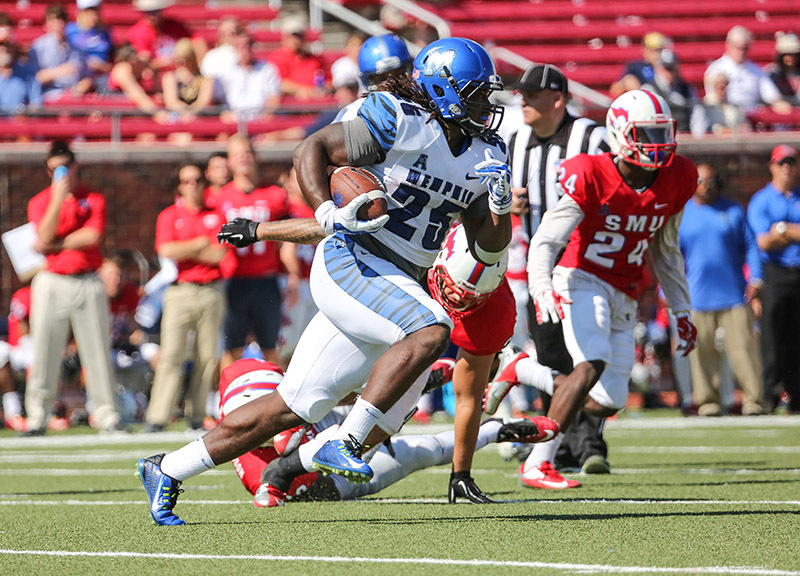 Memphis running back Jarvis Cooper (25) runs away from the Mustangs defense. 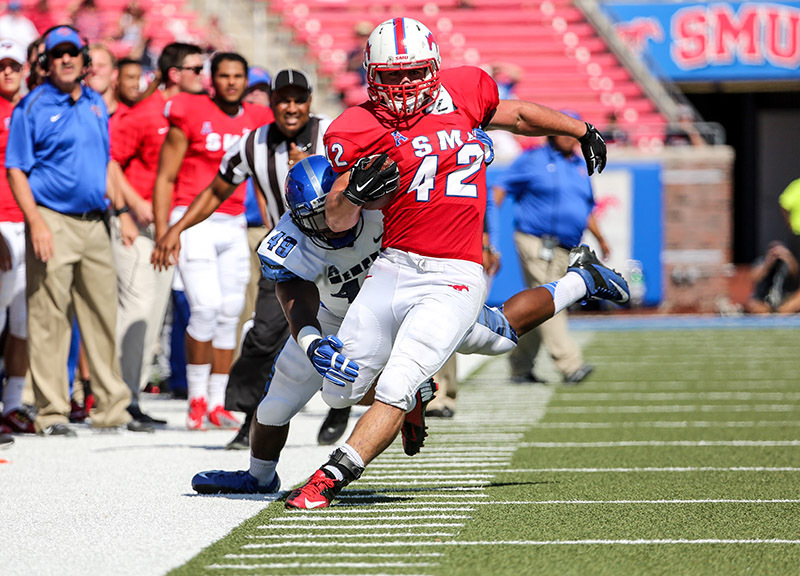 SMU is giving up 240 rushing yards per game. Memphis running back Jarvis Cooper (25) tumbles into the end zone after taking a shot from SMU defensive back Darrion Richardson (29). 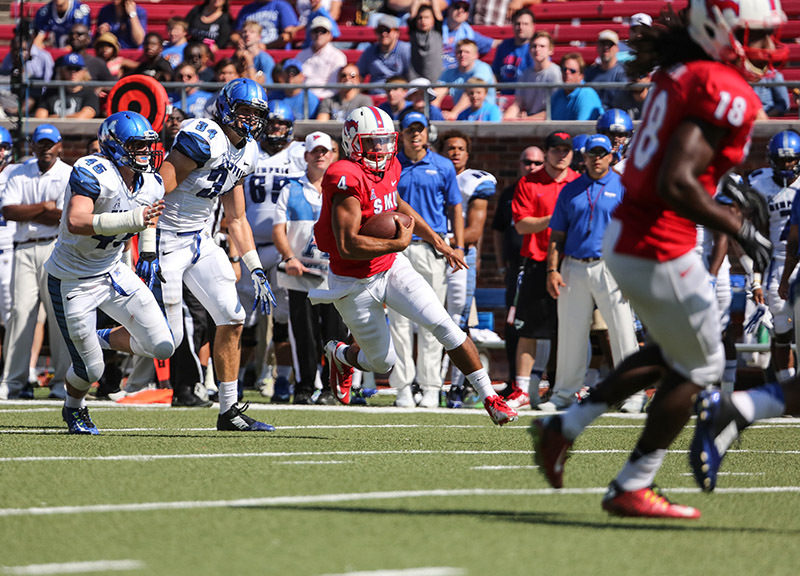 SMU quarterback Matt Davis (4) scrambles through the Memphis defense. Davis replaced quarterback Garrett Krstich in the second half and led the team in rushing yards with 55. 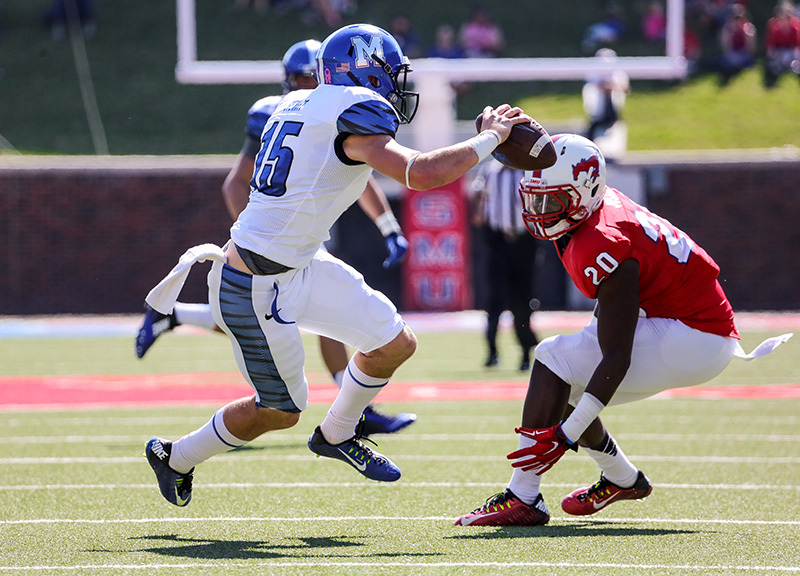 Backup Memphis quarterback Jason Stewart (15) jukes SMU defensive back A.J. Justice (20). 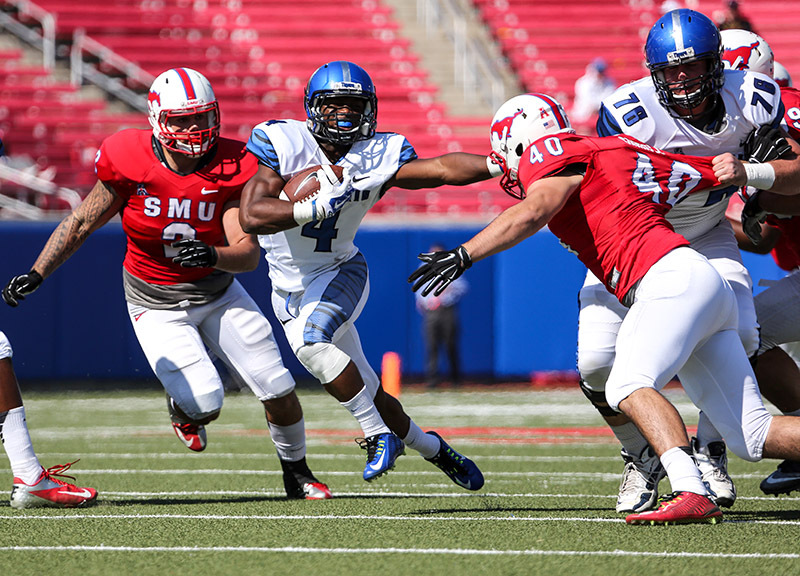 Memphis running back Robert Davis (4) stiff arms SMU linebacker Carlos Carroll (40). 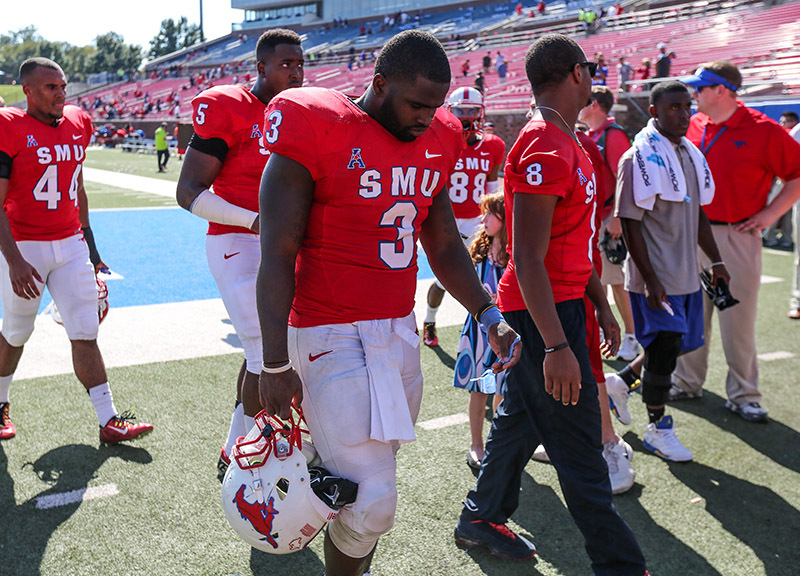 SMU linebacker Kevin Pope (3) walks off the field after SMU' 10-48 loss to Memphis. The Mustangs are now 0-7 and have a bye next week. 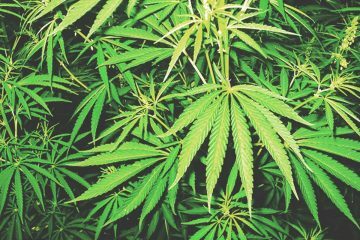 Previous ArticleThings To Do On Monday, October 27.